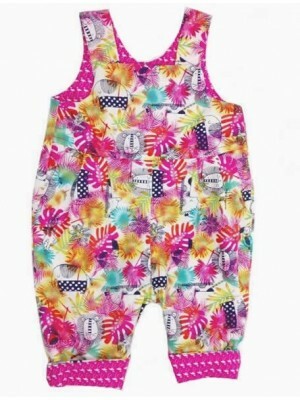 A cheerful pair of Jolly Jungle reversible dungarees with a happy animal print on one side and a mint spot on the other. Popper openings at the crotch and shoulder. Fabric Content – 100% Cotton Garment Care - Cool machine w..
A cheerful pair of dungarees with a floral print on one side and a pink spot on the other. Popper openings at the shoulder and crotch. Take a look at the cute little sun hat to match. 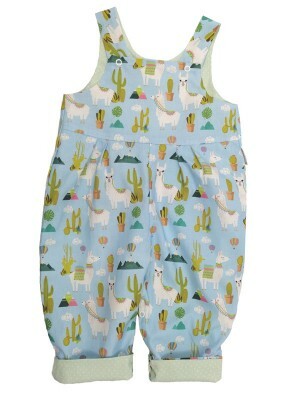 Fabric Content – 100% Cotton Garment Care – Cool m..
A gorgeous pair of reversible dungarees with a cute Llama print on one side and a mint spot on the other. Popper openings at the shoulder and crotch. These pretty dungarees have a sun hat and bag to match. Fabric Content - 100% Cot.. 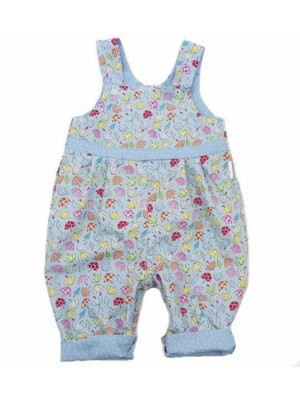 Totally reversible girls dungarees with a beautiful floral print on one side and a soft red needlecord on the other. Popper openings on the shoulder and crotch. We have a lovely little hat and bag to match. A perfect christmas outfit..
A beautiful pair of summer dungarees with a gorgeous tropical print on one side and pink flamingos on the other. Perfect for a holiday or to brighten any day. 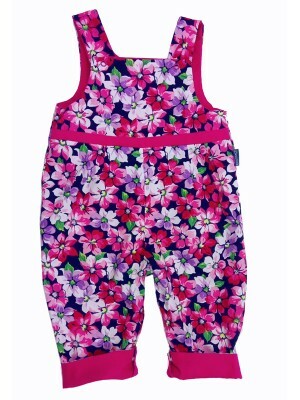 Popper openings at the crotch and shoulder Fabric Content – 100% Cotton ..
A cute pair of 100% cotton summer dungarees, completely reversible with a mass of umbrellas on one side and blue cotton print on the other. We have a cute Gigi sun hat to match. Fabric Content – 100% Cotton Garment Care - C..
A perfect pair of 100% cotton dungarees for a summer holiday or a fun day out. Popper openings at the shoulder and crotch. We have a perfect little sun hat to complete the outfit. Fabric Content – 100% Cotton Garment Care - ..
A pretty pair of reversible dungarees featuring popper openings at the shoulder and crotch. Matches perfectly with our Blue Jasmine sun hat. Fabric Content – 100% Cotton Garment Care - Cool machine wash. .. 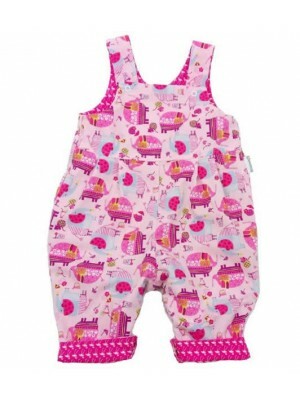 The cutest pair of 100% cotton dungarees and completely reversible with elephants on one side and flamingos on the other. Popper openings at the shoulder and crotch. We also have a pretty sun hat to match. 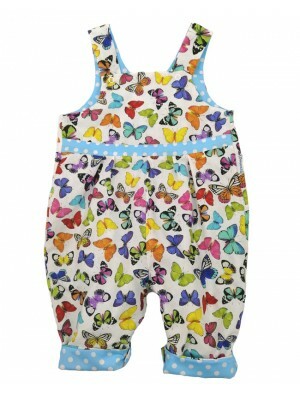 Fabric Content – 100% Cotton&..
Multi coloured butterflies on a white cotton on one side and a turquoise spot on the reverse. Popper openings at the crotch and shoulder. 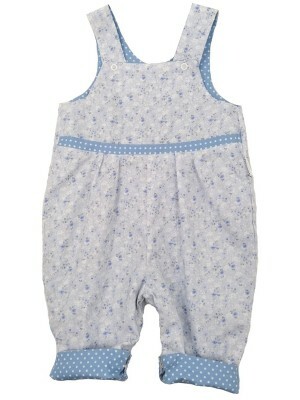 Fabric Content – 100% Cotton Garment Care - Cool machine wash. ..
Reversible dungarees with needlecord on both sides. Really snuggly and warm. 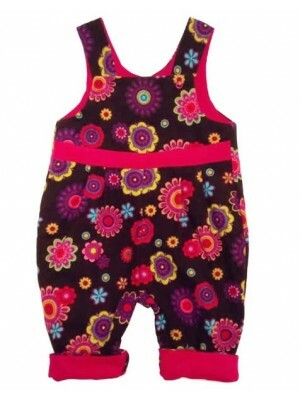 A vibrate floral print on one side and a cerise needlecord on the other. Popper openings at the shoulder and crotch. 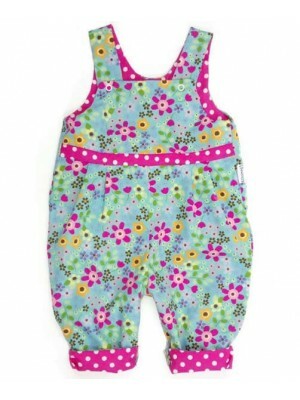 Fabric Content – 100% Cotton..
A pretty pair of bright floral girls dungarees with a soft pink needlecord on the reverse. Popper openings at the shoulder and crotch. 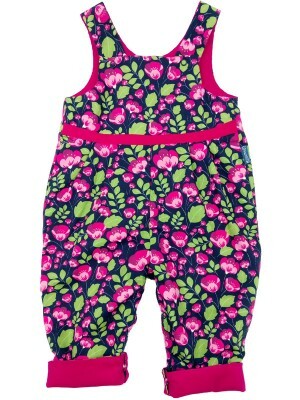 A beautiful pair of floral girls dungarees to brighten any day. Fabric Content – 10..
A gorgeous pair of reversible girls denim dungarees with a soft pretty pink needlecord on the reverse. Popper openings at the shoulder and crotch. 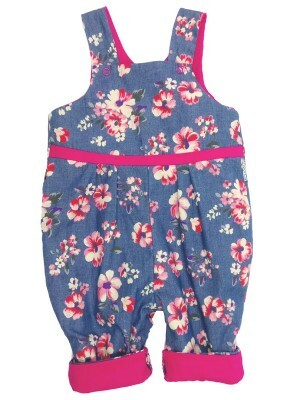 A perfect and practical pair of denim dungarees for a little girl. 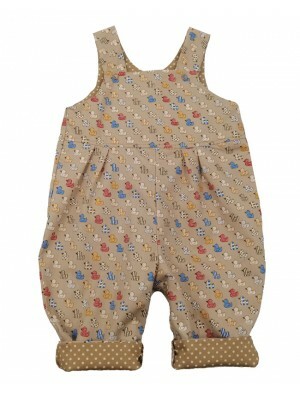 Take a look at the..
A cotton fabric with a mass of ducks on one side of these dungarees and a beige print on the other. Popper openings at the shoulder and crotch. Fabric Content – 100% Cotton Garment Care – Cool machine wash ..